There’s something so viscerally satisfying about this, and there’s important lesson as well. 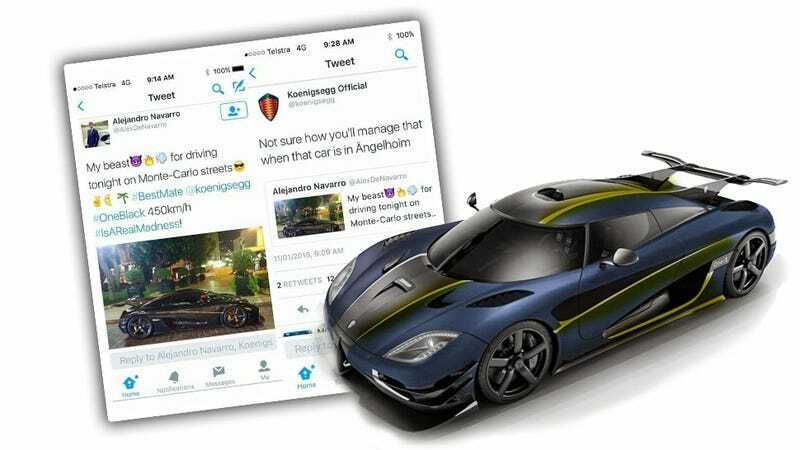 Look, if you’re going to lie on Twitter about having an absurdly exclusive supercar to drive around, best to not tag the only people in the world who know you’re lying. Like this guy did, with a black Koenigsegg One:1. My beast [purple demon head] [fire] [wind or fart] for driving tonight on Monte-Carlo streets [sunglass face] [fingers signing roman numeral 5] [crescent moon] [palm tree] #BestMate @koenigsegg #OneBlack 450kn.h #IsARealMadness! Oh boy. Ängelholm, Sweden is where Koenigsegg is based, and, interestingly, that black One:1 is as well. A quick consultation to your desktop globe will confirm that Monte Carlo is not in Sweden, and Mr. Navarro may not have been telling the truth about the beast he’ll be driving tonight on Monte Carlo streets. It may be more likely that a rental Fiat Panda #IsARealMadness. Alex, come on buddy, use your head. Don’t tag the company that makes insanely rare cars in Tweets where you lie about driving them! This just ends in tears. Of you know, laughter for us, embarrassment for you.